Air pollution originating from rapid industrialization, urbanization, population growth and economic development has disturbed the urban ecosystems of ecologically sensitive regions like the Indo-Burma hot spot, and they are under severe air pollution stress with limited resources to collect data on what is happening. Air pollutants comprised of both particulate matter (PM) and gaseous pollutants may cause adverse health effects in human, affect plant life and impact the global environment by changing the atmosphere of the earth. It is now well established that urban PM may also contain magnetic particles along with other air pollutants. Biomonitoring of PM through magnetic properties, known as biomagnetic monitoring, measures the magnetic parameters of dust loaded plant leaves, giving a new opportunity to monitor. Compared to existing conventional technologies, biomagnetic monitoring is an eco-friendly technique perfect in urban areas. 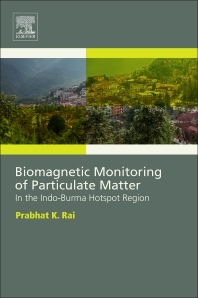 Biomagnetic Monitoring of Particulate Matter reviews the issues with PM and the potential of these methods to on tropical vegetation on a variety of flora which represent the biodiversity of the Indo-Burma Hot Spot. Prabhat Rai is a highly published Assistant Professor in the Department of Environmental Science , within the School of Earth Science and Natural Resource Management at Mizoram University. His research focuses on heavy metal pollution, phytoremediation and environmental sustainability in development areas.